They ended their epic U.S. road trip under a hail of vitriol, accused on social media of disrespecting scores of America's most sacred natural wonders. Now, the 'High on Life' crew are cleared for a return to the land of the free and 'High Noon' legal showdown in a Wyoming courtroom. They ended their epic U.S. road trip under a hail of vitriol, accused on social media of disrespecting scores of America's most sacred natural wonders. Now the 'High on Life' crew has been cleared for a return to the land of the free for their 'High Noon' moment: a legal showdown in a Wyoming courtroom on some of the most unusual charges their lawyer says he's ever dealt with. Justis Cooper Price-Brown, Charles Ryker Gamble and Alexey Andriyovych Lyakh already faced misdemeanour charges for allegedly walking off a boardwalk last May to get next to Yellowstone's Grand Prismatic Spring. But defence attorney Thomas Fleener says they've now been ticketed for riding a bike improperly in Death Valley and flying a drone and taking photographs in both Colorado's Mesa Verde and Utah's Zion National Park. Fleener has represented a man in Guantanamo Bay. But he says nothing quite compares to this case. "They're not killing people. It's terrible. They've been massacred in social media. Their brand has been damaged. They are three nice young men that have never been in trouble before, and they're just getting massacred," Fleener said. "This has been, in my opinion, blown out of proportion 1,000 per cent. It's nuts that we're dealing with riding bicycle tickets and photograph tickets and facing the possibility of jail time." A Wyoming U.S. District Court judge quashed arrest warrants this week that would have seen Price-Brown, Gamble and Lyakh arrested at the border if they tried to re-enter the United States. 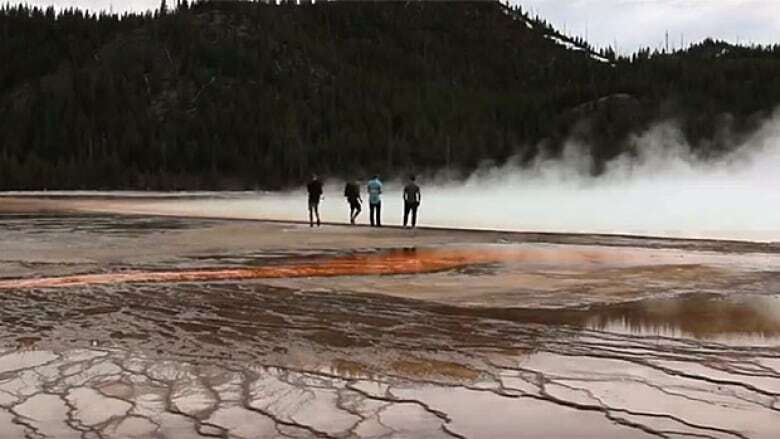 The three men were originally charged along with another accused in May after witnesses provided photos and video of the Yellowstone incident. It's a federal offence to travel off boardwalks or trails or to create a hazardous or physically offensive condition within the boundaries of Yellowstone National Park. Pictures of the Yellowstone incident were removed from the website for the men's company High on Life, which sells clothes, organizes parties and entertainment and makes YouTube videos. Price-Brown, Gamble, Lyakh and the other member of the four-man crew offered an apology and a $5,000 donation to the park. But the social media outcry prompted detractors to pore through their Facebook page for evidence of other infractions, like water-skiing on Utah's Bonneville Salt Flats. Fleener says authorities did the same. "After they were seen walking off the boardwalk in Yellowstone, which everyone knows about, the government went on their Facebook page and realized that they had actually been in several national parks," he said. "So they viewed the videos of the High-on-Life boys in various national parks and issued them citations based on the videos that were on their Facebook page." Fleener says he hopes all the issues can be dealt with at once in November. He says he doesn't think his clients should have to face the possibility of jail, despite calls for severe punishment from their detractors. "Almost every minor violation in the United States carries the possibility of jail. It's just that jail isn't ordinarily given," he said. "I expect this to be handled with a series of fines, but jail is certainly a legal possibility and it's something we'll be working to avoid." "There really is no such thing as a 'perfect adventure,'" the introduction says. "No matter what, everyone will make some kind of mistake during their travels."